The weather lately has been cold and wet, which I kind of don't mind since that means I can still wear hand knitted socks in my rain boots. This is awesome because the sock knitting has been prolific as of late and it's good to know that I'll be able to wear and enjoy these fresh FOs before the weather warms up. The second pair of socks to be completed this year is a pair that I had cast on last October for Socktober, when I thought it was a great idea to cast on a handful of socks all at once, and had finally bound off the last stitch last month in January: the Slutty Pumpkin socks. This colourway was such a fun knit. This is my second time knitting with Nomadic Yarns, the first time being when I had knit the Halloweenie colourway a few years ago. If it weren't for the crappy Canadian dollar, I would've totally stocked up - especially when Ashley retired her Game of Thrones colourway (I still cry over that one!). It's probably for the best though, as I'm sure I would've gone completely broke as I can't make the choice between "The Infinite Abyss", "I Woke Up Like This", "Paradise", "Wanderlust", or "Knit Night" colourways and my weak willpower would've given in and I most likely would've added them all to my cart. I don't think telling my family, "sorry, we can't eat this month...but look at all this gorgeous yarn" would fly. One day though, one day some of these will be mine. For now, I'll just enjoy my Halloweenies and Slutty Pumpkins. There's not much to say about these, I stuck to my usual and most basic plain vanilla sock recipe with an afterthought heel so that all the focus could be on the oh so eye-catching colours. The pink is so spectacular and bold that both my camera and smartphone can't handle it. Actually, I don't know if many people can handle it either...unless you're a fan of pink. But I figured, if you can't have fun with your sock yarn choices, then when can you? I made this pair a little longer than previous pairs, mainly because I wanted to use up as much of the yarn as I possibly could. Which isn't that easy when you've got short legs. But I think I did an A-OK job as I had only 16 grams leftover. To eat up yarn I made the cuffs a little taller than usual by knitting them to 2.5" high, an extra half inch more than I normally have them at. I then finished them off with Jeny's Surprisingly Stretchy Bind Off, my most preferred bind off for socks. I know a lot of people don't like this bind off because of either the flared look the edge takes on when not worn, or because it's simply "too stretchy". I don't know about that last one, but the flared edge thing doesn't bother me because it doesn't look flared when the sock is worn. As long as the bind off does its job and I can keep my hand knit sock up on my leg without the edge becoming a woolly tourniquet, I don't give a hoot if the ribbing looks pretty or not. After all, I keep my all hand knit socks folded up in my sock organizer anyways. Anyhoo...like with all the socks I've knit, I'm pretty pleased with how this pair turned out. With minimal effort and without sacrificing too much yarn, the pair turned out practically identical. 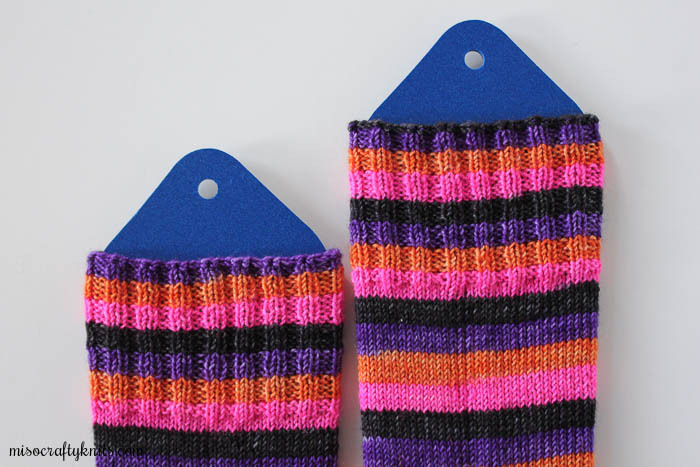 It was by sheer luck that once I finished the cuff on the first sock, I only had to cut out whatever was left of the stripe the sock ended on in order to start the toe of the second sock on the same colour as the first. This was the same for the afterthought heels. I'm a little nervous that my luck will run out when it comes to my sock knitting. Or maybe I've knit enough socks to finally know what I'm doing? Ha! Wouldn't that be something? Great job! I love the fun colors and the colourway name is funny and attention grabbing. Glad your wrists and hands are cooperating, enabling you to have wonderful sock knitting time. You lucky duck, Rebecca!! I saw that she had one in her shop...but can't justify the purchase after the exchange :( Oh well...there will be more colourways...and still not enough time to knit them all!! Love those socks! I've been eyeing the gorgeous Nomadic Yarns on instagram, but the exchange rate is total pants right now... which forces me to do the thing I keep saying I'm going to do... knit from my stash. I think knitting from stash is the only upside to the crappy dollar!! You are such an enabler! I've been eyeing the Gumdrop button all day. Being cooped inside while its -39 C will wear away at my willpower, I'm sure. Even with the horrible exchange rate! Amazing!!! these socks are too much beautiful. The combo of four colors look very charming. The pattern is very simple but too attractive. I want to buy these. is it for sell?